Eridu was one of the first urban communities to appear in Mesopotamia. The settlement may have been established 7000 years ago and by 5500 years ago it was thriving town with an imposing temple constructed on the site of an earlier shrine. 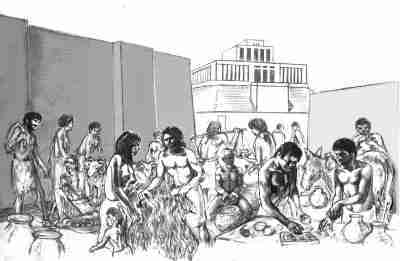 It was the advent of farming which provided the resource base that supported urban settlements. Moreover, agriculture encouraged trade, with surplus food and animal products being exchanged for other goods. Tally systems and simple abacus similar to those illustrated in this market scene, along with new systems of keeping account in this more complex society, by the use of tokens and symbols incised in clay, promoted the development of both mathematics and writing.